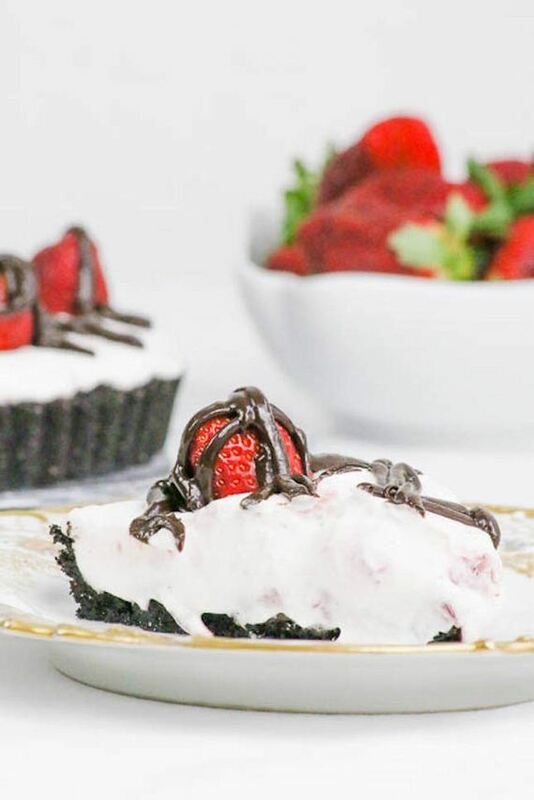 Check out these 15 amazing strawberry recipes that are perfect treats to make for the people you love this coming Valentine’s Day! Cheesecake is delicious. Strawberries are delicious. White chocolate is delicious too. 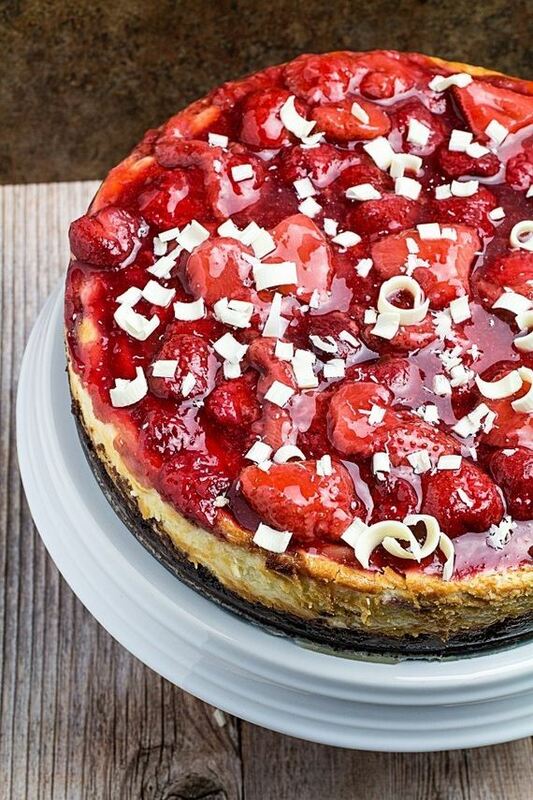 What’s not to love with this strawberry white chocolate cheesecake from Dishing Delish? 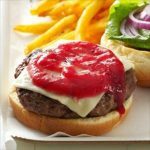 This particular recipe is especially light and it’s made with the perfect combination of strawberries and strawberry syrup. On top of that, the white chocolate included in the mixture and grated into delicious curls on top makes the whole cake even sweeter than it would have been. Have you always loved those little prepackaged Swiss roll cakes that so many kids take to school in their packed lunches? Well, we’ve found a homemade recipe for you that’s just like those, but even more delicious! 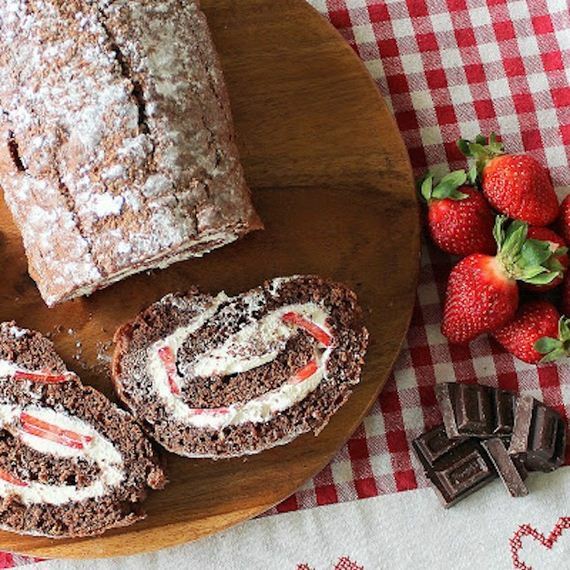 Besides the fact that almost everything tastes better homemade, this version of a yummy Swiss roll has strawberries rolled right up into the cake within the whipped cream filling. Get the recipe from PicNic! Certain holidays, like Easter and Valentine’s Day, are really big on marshmallow treats when it comes to what the stores will sell in their seasonal candy section. 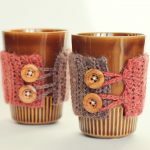 You might have guessed by now, however, that we love recreating the things we see in stores for ourselves. That’s why we were excited to find this delicious strawberry marshmallow recipe complete with a bit of chocolate coating on Fox and Briar! Sometimes it’s nice to balance a deliciously sweet and fruity flavour with something that’s got a little more spice. That’s why we really like strawberry recipes that involve cinnamon! It’s the perfect flavour combination without having one flavour overwhelm the other. Check out this awesomely moist and perfectly iced cake recipe from The Cake Chica. 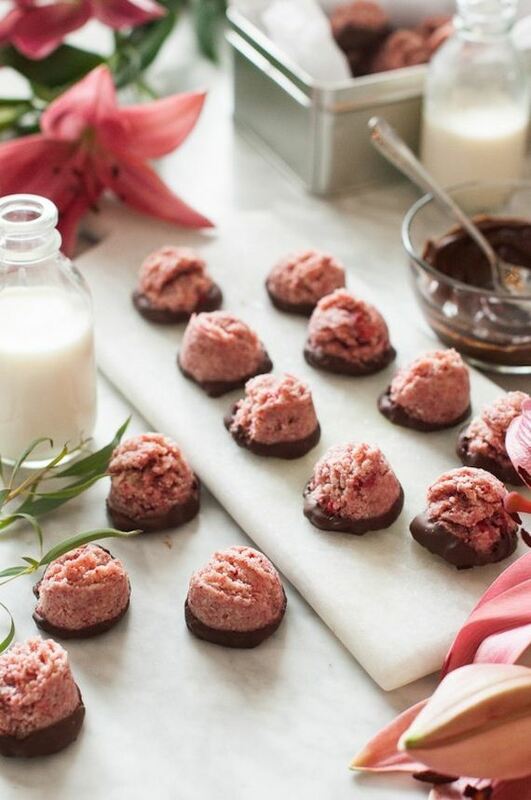 We’ve always loved truffle candies, but particularly when there’s chocolate involved. On top of that, we’ve always especially loved truffles that have a bit of crunch on the outside to balance out a smooth chocolate filling. 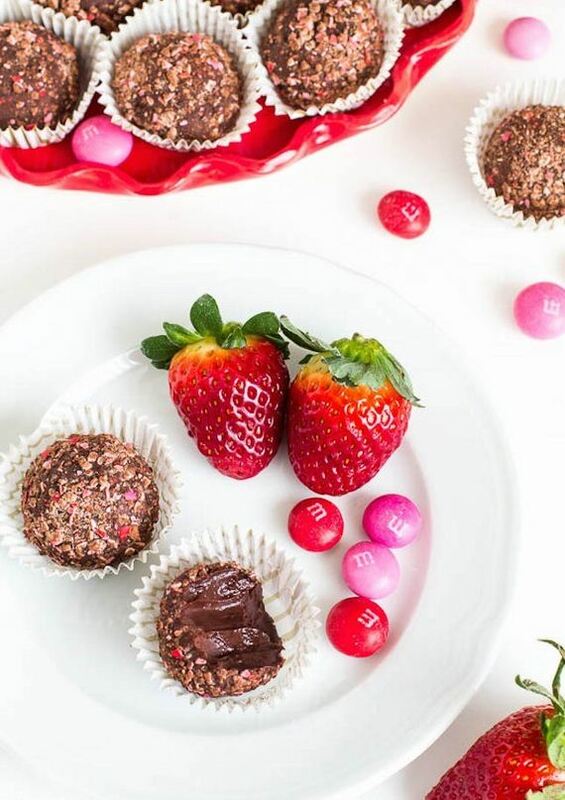 These particular truffles from Sweet & Savoury by Shinee achieve that combination thanks to a yummy crushed coating made from smashed strawberry M&M’s, which are seasonal around Valentine’s Day! 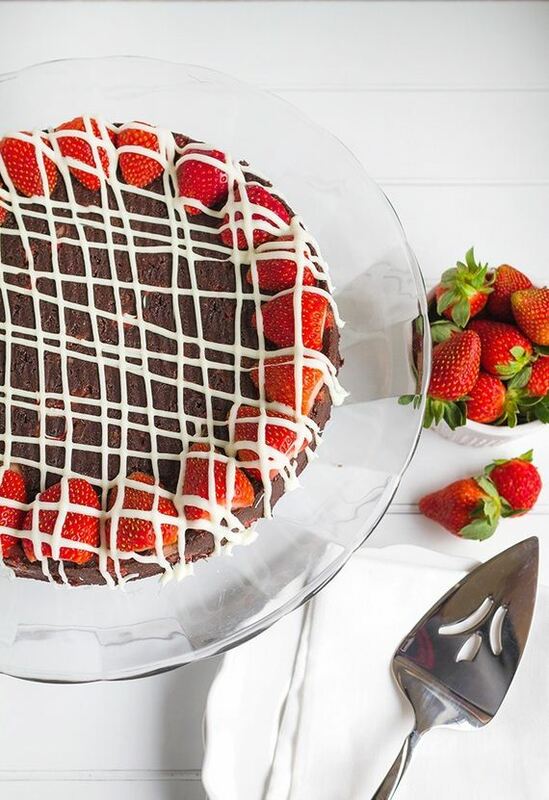 We’ve already talked about how much we love strawberries and how much we love truffles, but this delicious cake recipe from Capturing Joy adds a whole new taste element to the mix! 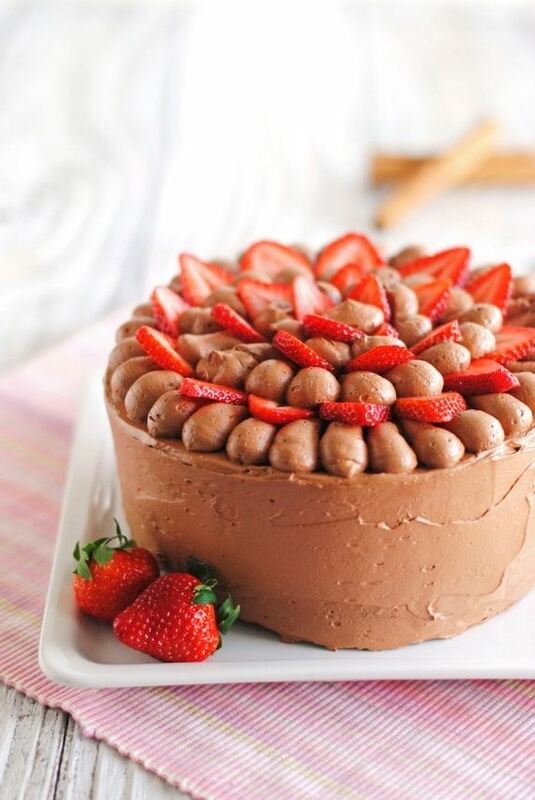 This cake is made with fudge, giving it an absolutely delectable texture that makes for a great food experience in combination with the slight crunch of the fresh strawberries. Whenever we heard the words “chocolate ganache”, our minds automatically picture decadent layers and the richest chocolate around. 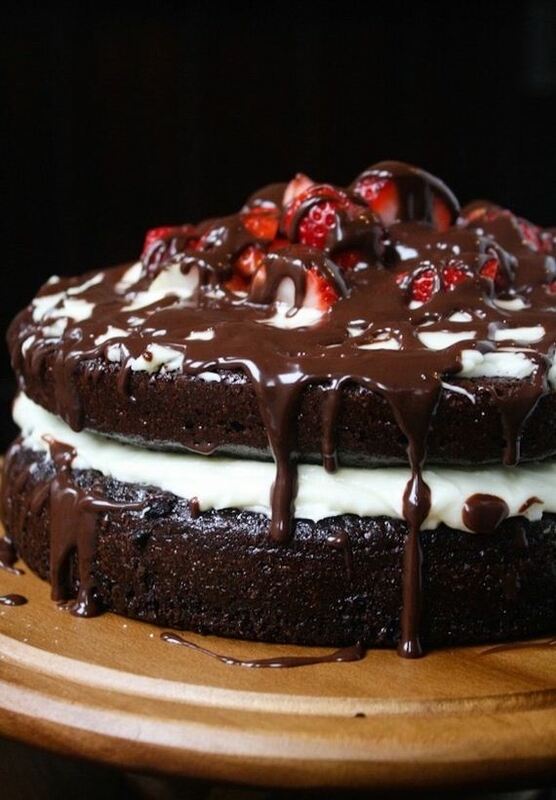 This particular cake has whipped cream in the centre, a thick drizzling of chocolate sauce, and a topping of amazingly fresh strawberries, making it just about as decadent and gourmet as we originally pictured. 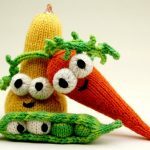 See how it’s made on A Savoury Feast! 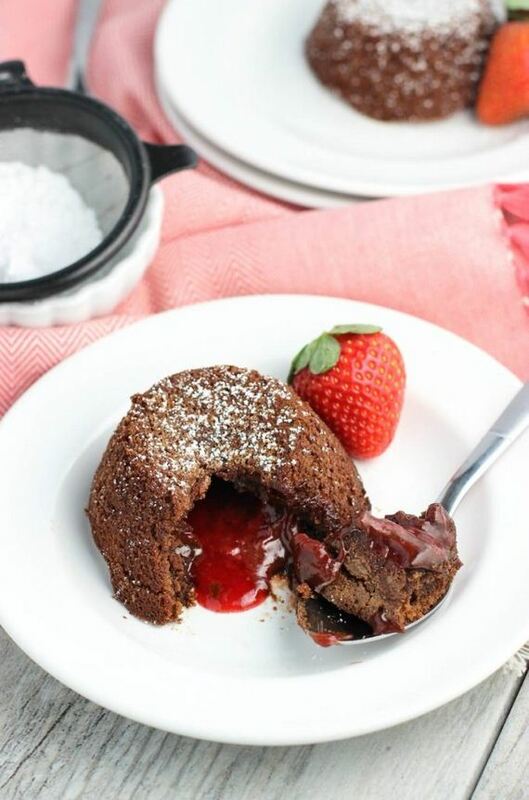 Have you always loved mouthwatering lava cakes and the way the rich chocolate spills out from the centre when you take the first bite? 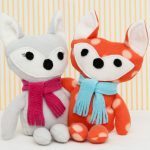 Well, we’ve got great news for strawberry lovers, because My Sequinned life has a version that’s filled with strawberry sauce instead of chocolate! It’s a little less rich, a little more fresh tasting, and just as scrumptious. Perhaps you’ve thought all of these cakes and things sound good, but your actual favourite type of treat is a frozen one involving ice cream? Then we’ve found the strawberry treat for you! The Crafting Nook guides you through the process of making little pies in individual servings, filled with strawberry flavouring and and a crunchy, ice cream cake-like layer on the bottom. Do you like the strawberry ice cream idea but you’d rather have something fun and overly sweet to really make it a treat? Try this delicious M&M cookie ice cream sandwich idea instead! 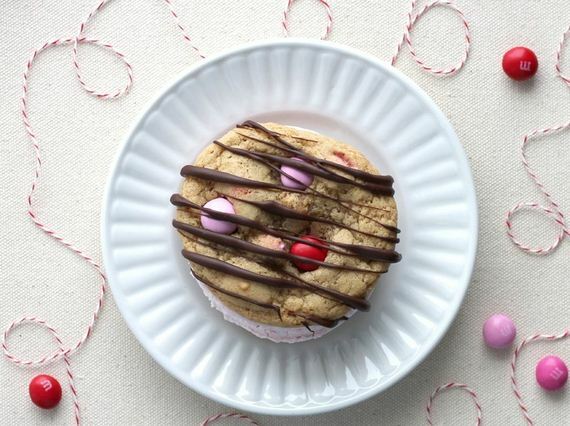 The ice cream in between the cookies is a delicious strawberry flavour that will keep you in the Valentine’s Day spirit. Get the recipe on The Craft Patch! Did you like the idea of the other truffles we talked about earlier a lot but you’d rather have a regular coating, then perhaps you’d rather have this version from Posh Little Designs! They’re still delicious and they still taste like strawberries, but it’s always nice to have options! 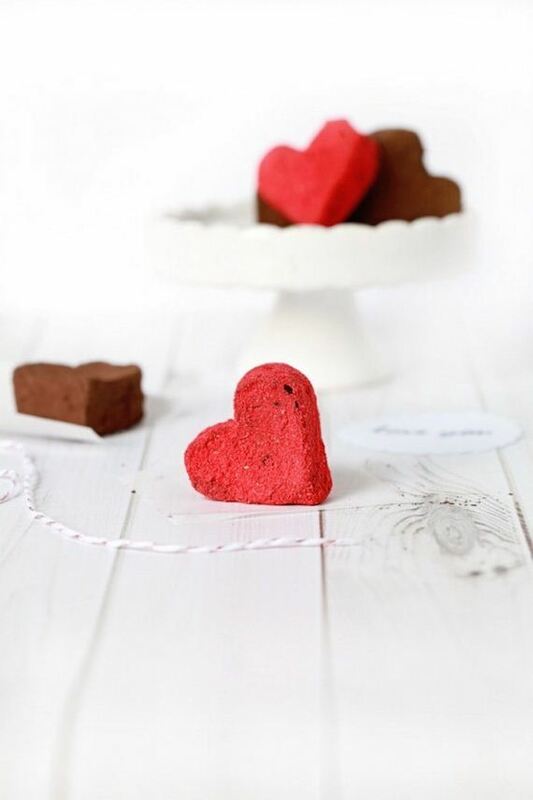 We think these truffles are extra cute because they’re shaped like little hearts. Have you always liked the idea of individualized cakes and pies? 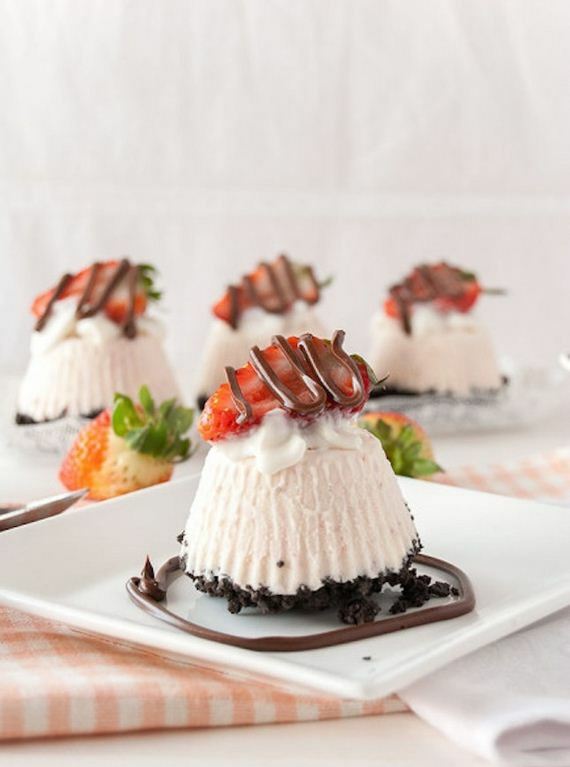 Then these heart-shaped chocolate strawberry dream desserts might be a lot more along the lines of what you’ve been hoping for as you scroll! Desserts Required guides you through the process of making little cakes that are deliciously creamy but still chalk full of those strawberries you love so much. 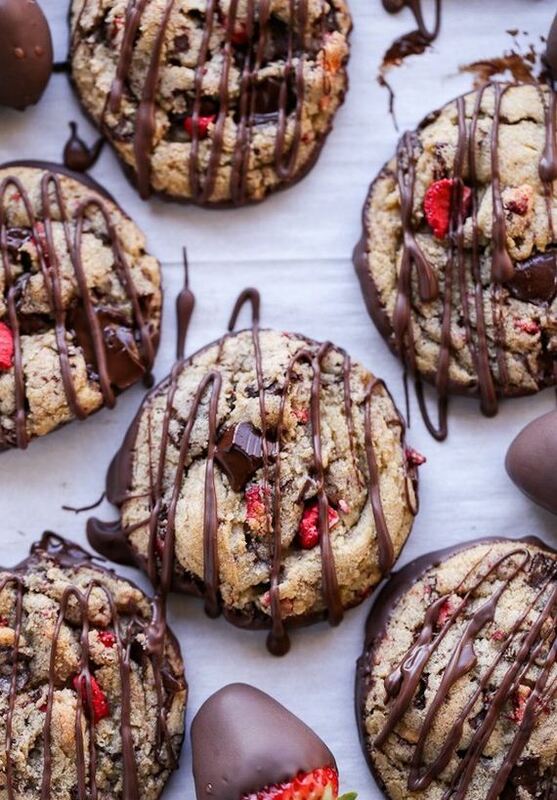 Warm, gooey chocolate chop cookies are one of the most delicious snacks we can think of… or, at least, they were until we were introduced to the concept of chocolate chip strawberry cookies! Bakerita shows you how to take that idea even further into deliciousness by making those cookies and then, once they’re baked and cooled, dipping them in chocolate and drizzling a chocolate layer on top! Macaroons come in all different flavours, but you could probably already guess that strawberry is one of our very favourites. Imagine how excited we were, then, when we found a strawberry macaroon recipe on The Kitchen McCabe! This isn’t just any recipe, though. This one is chocolate dipped, making it even more mouthwatering than it would have been already. Chocolate fudge brownies are one of our very favourite things. 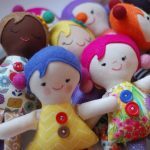 We love the taste, we love the texture, and to be honest, we even love the process of making them. 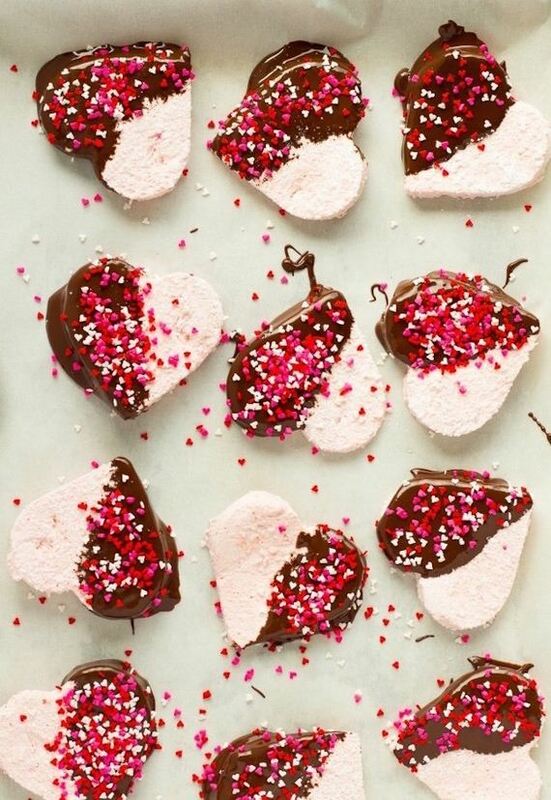 We love them even more, however, when we get to add delicious chunks of strawberry! 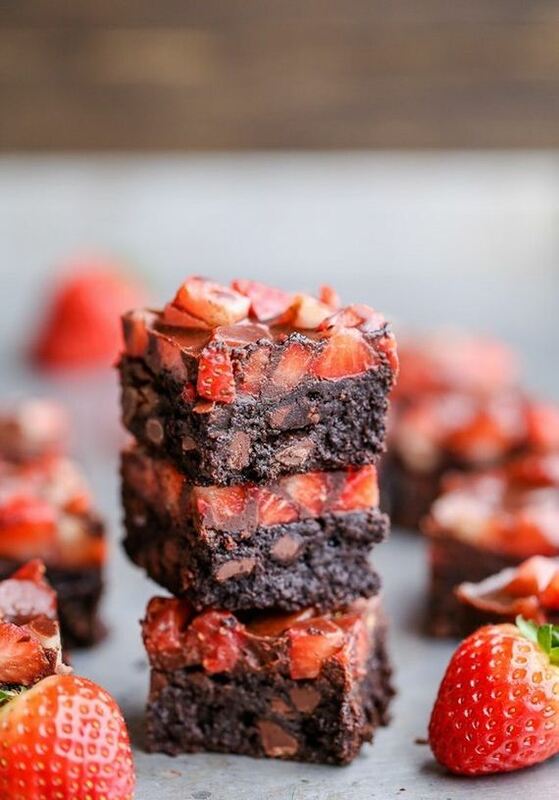 Bakerita guides you through the process of making strawberry brownies that are sweet, fresh, and smothered in chocolate.